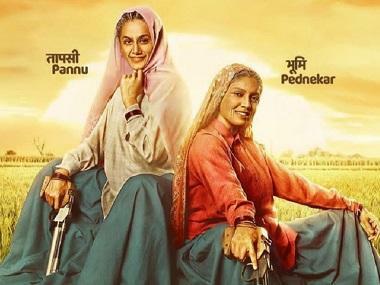 After introducing the world's oldest sharpshooters in a promotional video titled Shooter Dadi, Anurag Kashyap has unveiled the first poster of Saand Ki Aankh. 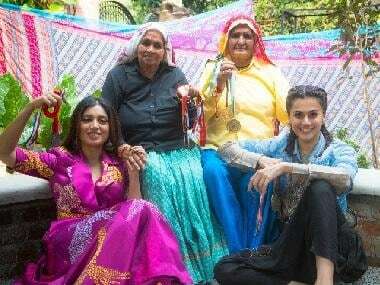 Starring Bhumi Pednekar and Taapsee Pannu in the lead, the film is a biopic on the octogenarian Chandro and Prakashi Tomar from Uttar Pradesh. With greying hair and saggy skin, Taapsee and Bhumi are seen sitting on a mound and grinning widely at the camera, proudly flaunting their pistols. They look uncannily similar to Chandro and Prakashi Tomar sporting a ghagra and a shirt, with a pallu atop their heads in the poster, captioned, "Tann Budha Hota Hain, Mann Budha Nai Hota" (It is the body that wears away with age, not the spirit). Apart from Taapsee and Bhumi, Saand Ki Aankh also features director Prakash Jha and Mukkabaaz star Viineet Singh in pivotal roles. Set in the hinterlands of Uttar Pradesh, the film went on floors in Meerut in February. Originally titled Womaniya, the film was renamed Saand Ki Aankh, following a title rights dispute. Saand Ki Aankh is being jointly produced by Anurag Kashyap and Nidhi Parmar. The film will mark writer Tushar Hiranandani's (Dishoom, Ek Villain, ABCD 2 and Grand Masti) directorial debut.